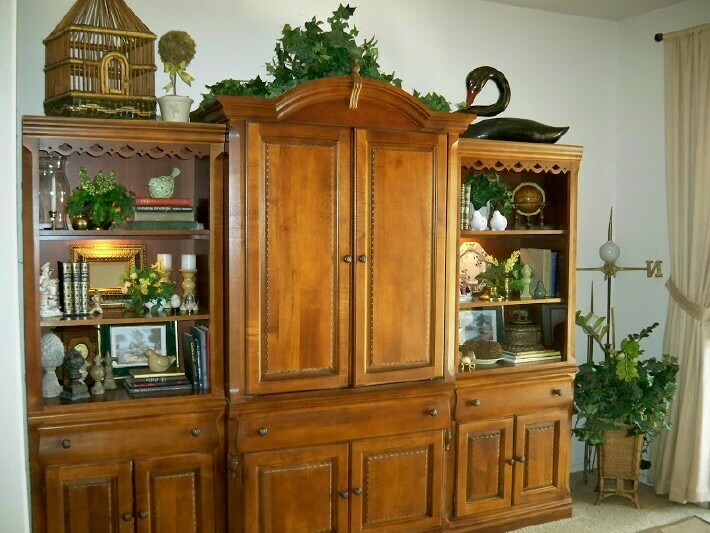 In our previous house the bookcases we had in our family room changed a lot. 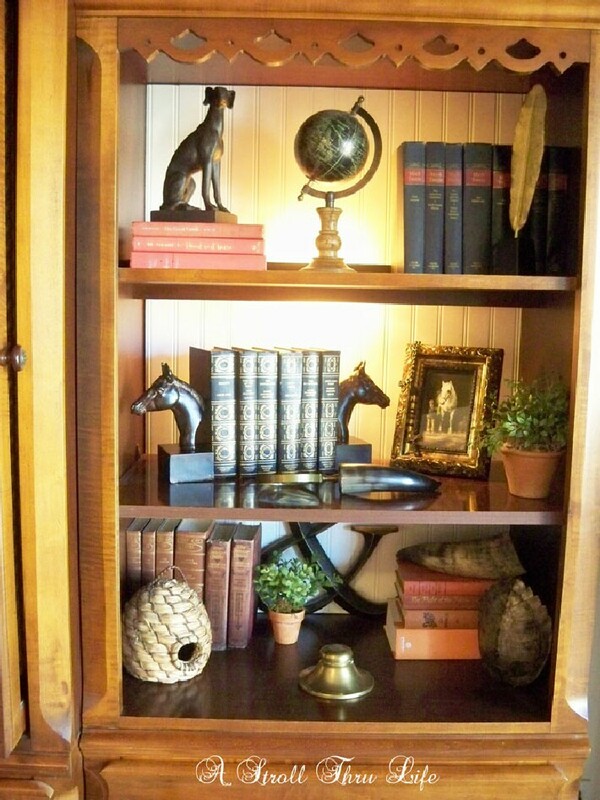 They were the perfect place for me to create all kinds of different vignettes. 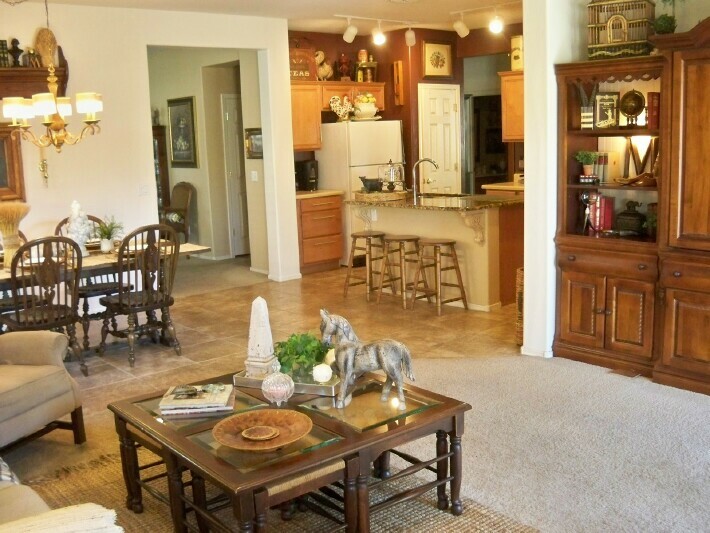 At one point our kitchen/family room and breakfast area were decorated with more of a Farmhouse style. 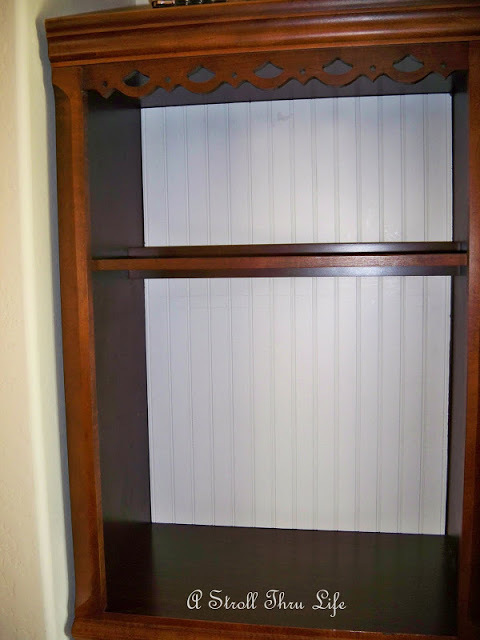 I thought we'd do a walk down memory lane to see how these bookcases changed all the time. 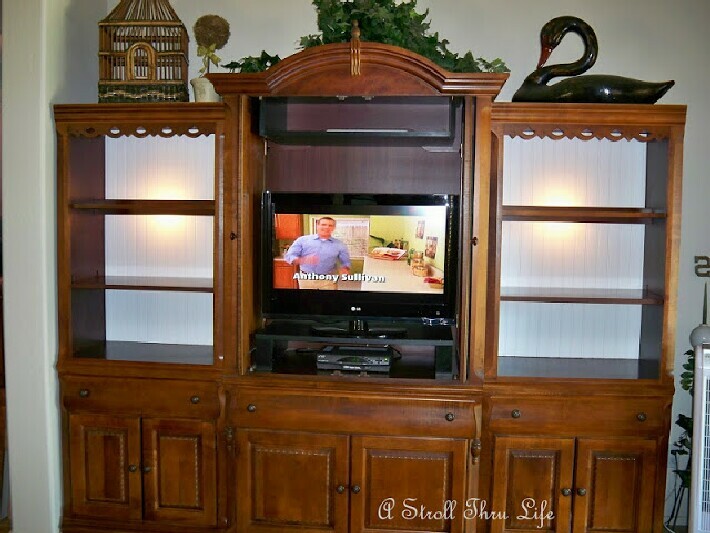 Our entertainment center is a piece we've had for years and years, it has fabulous storage and works well for us. Big enough for a 32" tv and in a small room that is fine. Plenty of storage for all the other electronics and movies. I also use this to store napkins in one drawer and my chargers in one of the side cupboards. 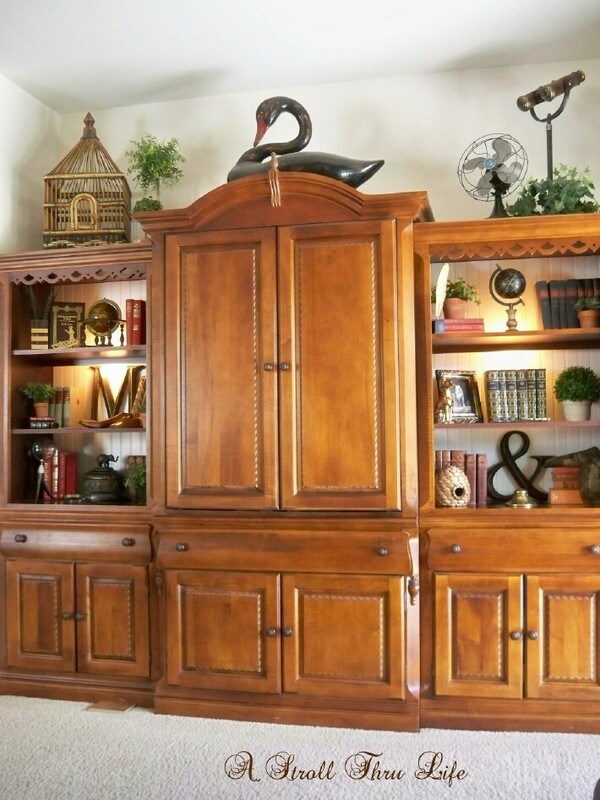 That's perfect since it is part of the kitchen/breakfast/familyroom space. Since this area of the house is done with a little more farmhouse decor than the living/dining areas, I keep the decor really casual. 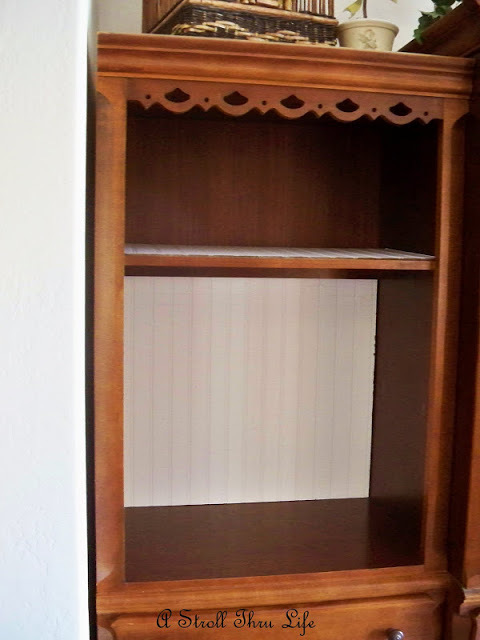 This is the only picture I could find to show how the bookcases looked before I added beadboard to the backs several years ago. Really dark and dreary. One sheet of beadboard was perfect. I just cut it to size and pushed it into the back. It isn't glued, so if I change my mind down the road I can change it. Major difference. Wow, this piece came to life. Now they really show off all of my "stuff". 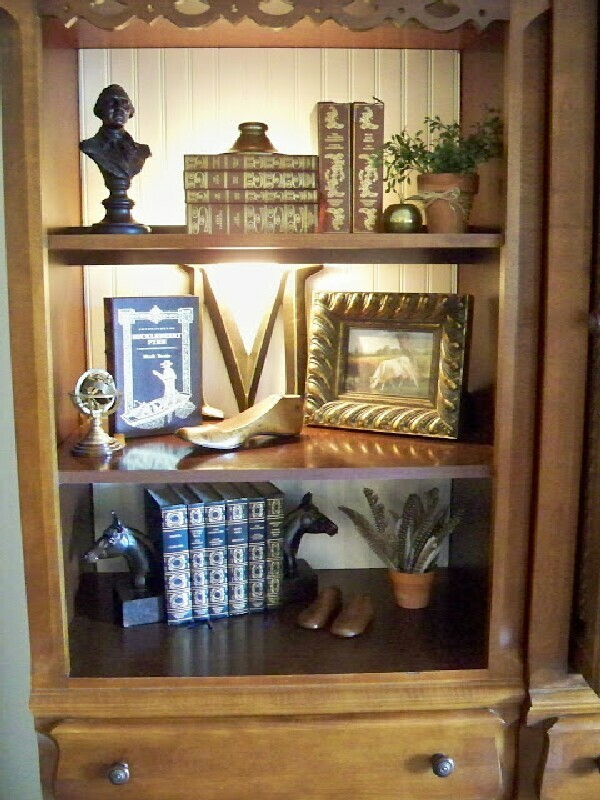 Here are a few different ways I've had the shelves styled. You can find some really great books at Goodwill, Salvation Army and Thrift stores for a $1 or so. 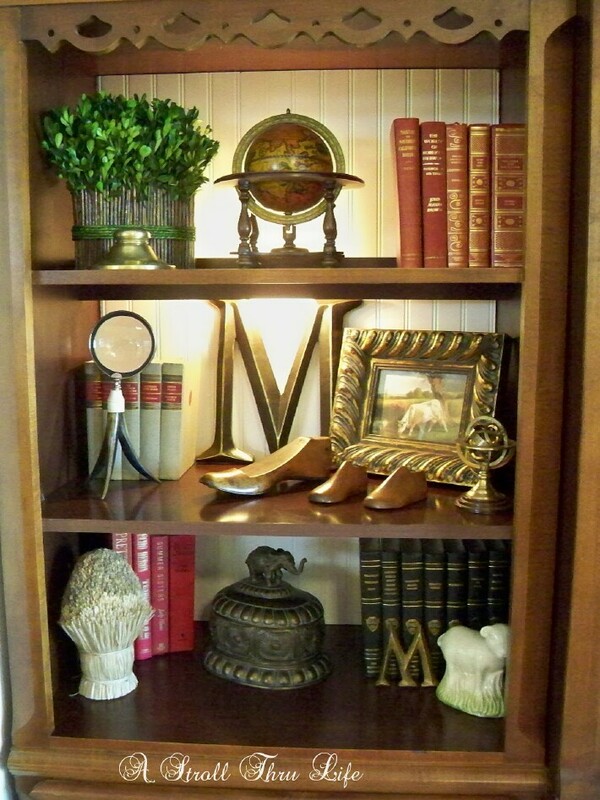 I think it adds interest when you place some of your items in front of books and pictures. It gives the shelves depth. 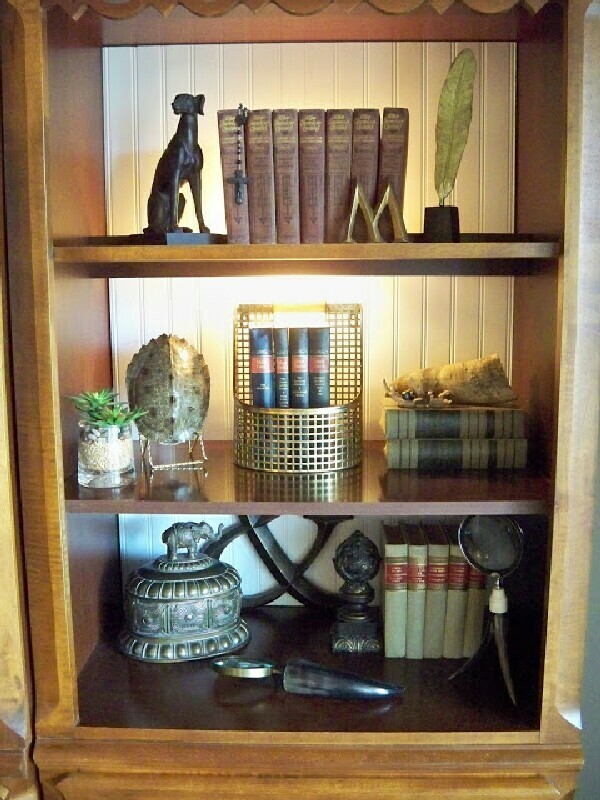 The same items look totally different when you use them in a different vignette. 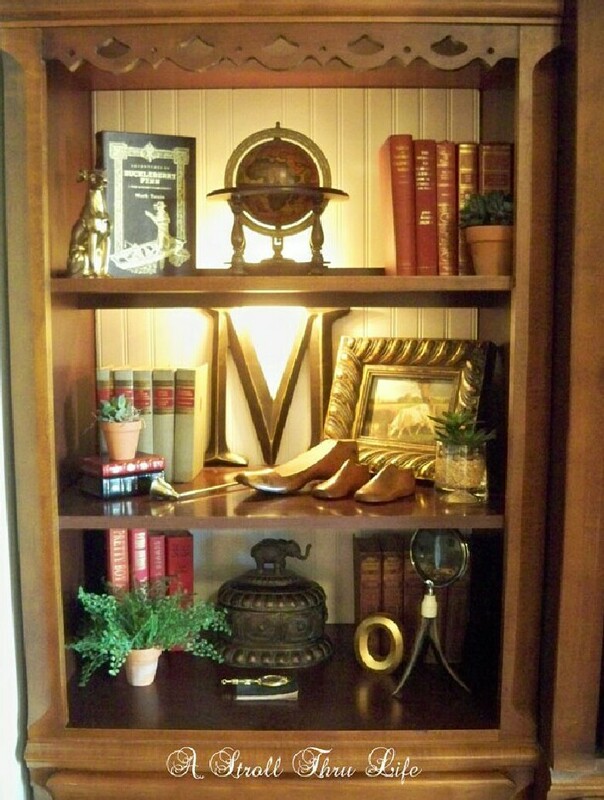 Play around with your shelves to showcase all the items that mean something to you. They are a great place not only for your books, but for all of your treasures. 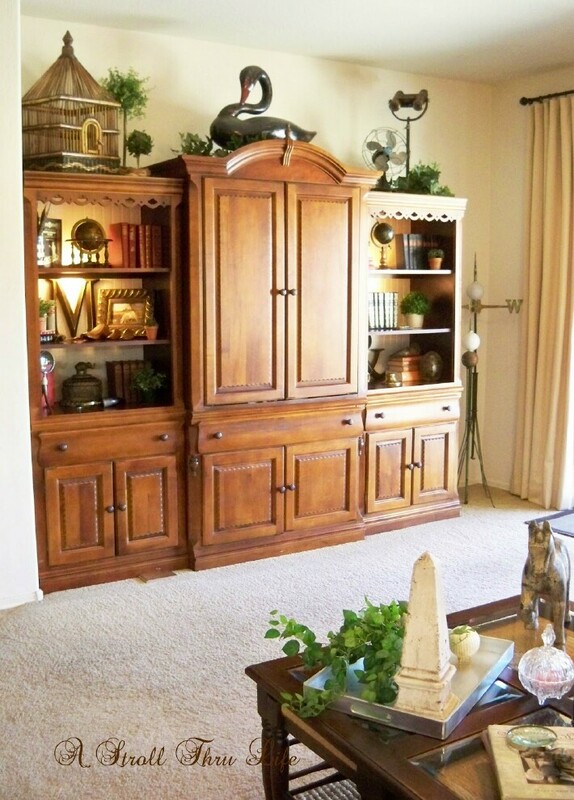 The entertainment center sits across from the settee, chair and my desk. It give me ample storage for all my office needs and a place to play with all my favorite accessories too. Wow! What a difference that bead board makes. It really brightens the whole piece up. 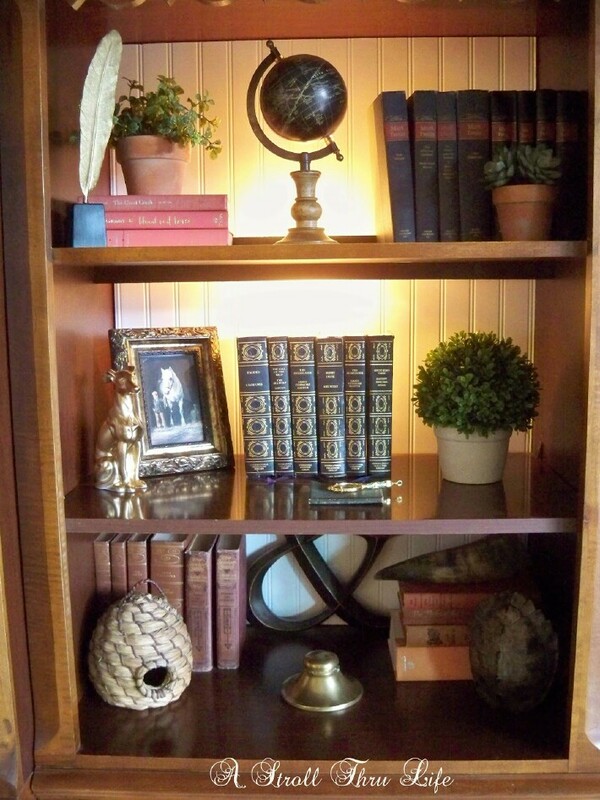 Love your styling on the bookshelves too. Absolutely stunning vignettes and the white beadboard sheets really accentuates/displays your treasures beautifully! The bead board really brightened things up. I love your office/girl cave. What a great, functional space to work or relax. I love a room that serves multiple functions. Wow this is so great Marty. 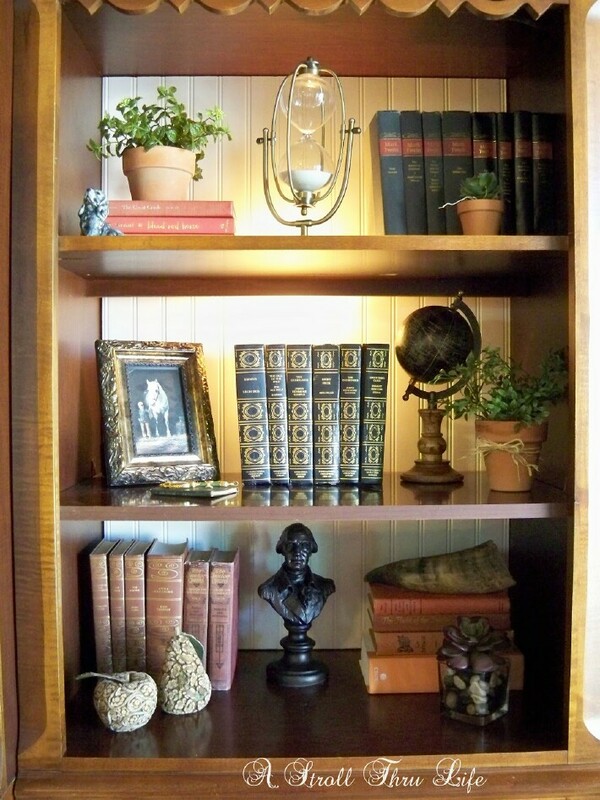 I love the bead board and I love how you styled each shelf. Just amazing.